The death rate from measles worldwide has dropped by 74% during the first decade of this century, an impressive figure, but less than the 90% target, researchers from WHO (World Health Organization), Penn State University, and the CDC (Centers for Disease Control and Prevention) reported in The Lancet today. The authors added that there is still serious concern for areas such as Africa and India. All countries belonging to WHO backed a 90% measles death rate reduction by 2010, compared to 2000. Report author, Dr. Peter Strebel, informs that today's issue coincides with the World Health Organization's World Immunization Week. The target initially went according to plan. The 50% measles mortality fall achieved by 2005 (compared to 1999) was reached. Enthusiasm led member states to up the figure to 90% by 2010. However, in 2002 the plan was interrupted by endemic transmission of measles in the Americas. WHO says that all of its regions, except for southeast Asia, aim to have the disease eliminated by 2020. Those who created this report say that they used a new model which utilizes surveillance objective data to calculate measles incidence, as well as age distribution of cases, and takes into account herd immunity. Only 74% of people in India have been vaccinated for measles - a low rate. The report suggests this is the main reason why measles mortality remains high. Supplementary mass vaccination campaigns over the last ten years amounted to over 1 billion measles vaccine doses. Experts say these supplementary doses played a major part in bringing down mortality rates. "Despite rapid progress in measles control from 2000 to 2007, delayed implementation of accelerated disease control in India and continued outbreaks in Africa stalled momentum towards the 2010 global measles mortality reduction goal. Intensified control measures and renewed political and financial commitment are needed to achieve mortality reduction targets and lay the foundation for future global eradication of measles." "Measles eradication is biologically feasible and while no formal eradication goal has yet been set, progress on the mortality reduction goal will lead to consideration for an eradication goal. This paper highlights critical gaps in available data to guide prevention programs; surveillance and vital record registrations are inadequate in much of the world. What is most needed is not more sophisticated ways to estimate mortality, but to measure mortality directly. As measles is considered for eradication, it will be critical to improve surveillance to the point that deaths and cases will actually be measured, not estimated. " "Assessment of the 2010 global measles mortality reduction goal: results from a model of surveillance data"
Nordqvist, Christian. 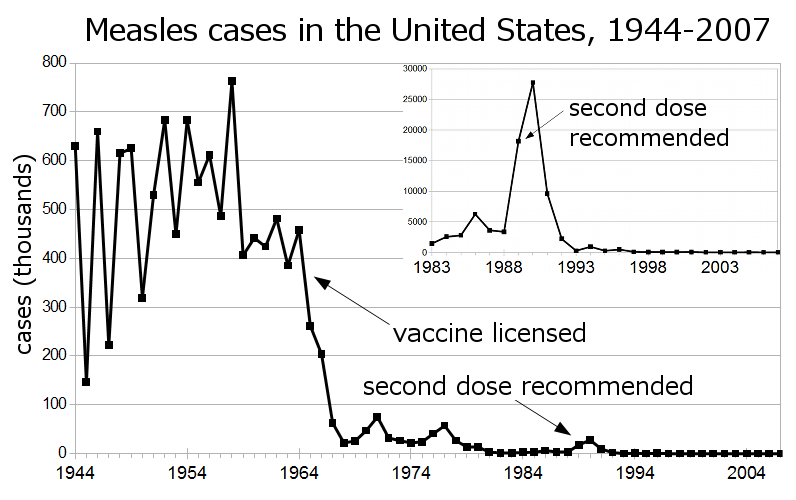 "Measles Mortality Drops 74% Globally In Ten Years." Medical News Today. MediLexicon, Intl., 24 Apr. 2012. Web.